If you enjoy a tasty plate of spaghetti or linguine (shown above), thank Thomas Jefferson for bringing the first pasta machine to America. Photo courtesy Georgia Pecan Association. This is Page 4 of a five-page article; here, pasta history in America. Click on the black links below to visit other pages. For centuries, the Italian peninsula had comprised disparate states under different rulers, whose people spoke different dialects. In 1862, after insurrection, revolution and war, King Vittorio Emanuele II, the ruler of Sardinia, helped unite the warring states into the nation of Italy. With peace, travel was much safer and more frequent. Italians gained exposure to pasta-making techniques and recipes of other regions, with an explosion in creativity and proliferation of shapes. Then, in the decades from 1880 to 1900, waves of southern Italians began to immigrate to America, bringing pasta with them. However, pasta first came to the U.S. much earlier. 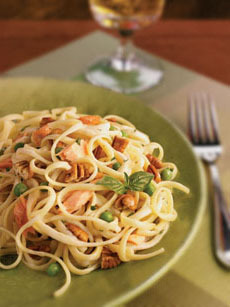 Thomas Jefferson served as minister to France from 1785 to 1789, and was introduced to pasta during a trip to Naples. He returned to the U.S. with crates of “maccheroni” and a pasta-making machine (which he proceeded to redesign). While Corby Kummer references a pasta factory established in Philadelphia in 1798 by a Frenchman (Zingerman’s Guide to Good Eating gives the date as 1794), any name and details beyond this are lacking. 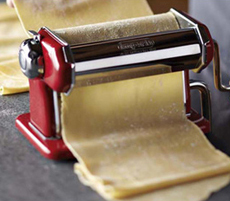 A modern pasta machine for home and artisan pasta makers. Photo courtesy Williams-Sonoma. Most sources, including the National Pasta Association, credit a later Frenchman with establishing America’s first pasta factory, in Brooklyn in 1848. A flour miller from Lyon, Antoine Zerega, had a horse in his basement to turn the millstone; and like the Neapolitans, he hung his spaghetti strands on the roof to dry. Today, the fifth generation of Zeregas run the leading supplier of pasta to the foodservice industry in North America. Spaghetti and meatballs had yet to appear. Macaroni had been brought to England earlier by the Genovese sailors, and the British baked it with cheese and cream—in essence, making macaroni and cheese, a preparation also popular in the north of Italy. They also baked pasta in sweet dessert custards, similar to German-Jewish noodle puddings. These recipes crossed the pond and were enjoyed by 19th-century Americans. According to Corby Kummer, upper-class Americans also purchased pasta imported from Sicily, which then, as today, had more cachet than the domestic product. The information in the remainder of this article comes largely from Mr. Kummer’s extensive piece, Pasta: Where It Came From And How It Got There. As other pasta factories sprouted up, the cost of pasta became more affordable. By the time of the Civil War (1861 to 1865), even the working classes could afford a pasta dinner. Cookbooks of the period indicate that the common way to prepare pasta was still baked with cheese and cream. In the mid-1880s, according to food historian Karen Hess, cookbooks published as far west as Kansas included recipes for macaroni, some involving a tomato and meat sauce. But pasta did not become the beloved dish it is today: It lost its cachet once the masses could afford it. The fashionable restaurants of New York, which served Continental cuisine, did not serve pasta or any other traditional Italian dish, even though many of these restaurants were run by Italians. The huge wave of Italian immigration that began toward the end of the 19th century was ultimately responsible for pasta becoming an American staple. From 1880 to 1921, more than five million Italians immigrated to America, three quarters of them from the regions south of Rome. Two scholars have studied the food of the Italian immigrants extensively: Harvey Levenstein, a professor of history at McMaster University in Ontario, and Joseph Conlin, a professor of history at Chico State University in California. They report that the immigrants from Campania became established as grocers, such that the tomato paste, oregano and garlic basic to their region’s cuisine were more readily available than seasonings typical of other regions, such as Sicilian pine nuts, wild fennel, and saffron or ginger for the cuisine of Basilicata, the region to the east of Campania. 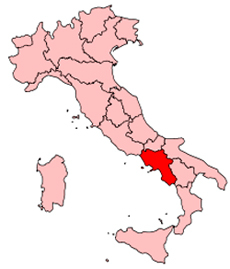 Map of Italy, highlighting Campania, whose ingredienets gave rise to Italian American cuisine. Image courtesy of Wikipedia. Thus, the seasonings used for “Italian food” in America were primarily the classic ones of Campania carried in the local grocery stores, because it was difficult and expensive to obtain ingredients from other regions. What became Italian-American cuisine was different from the old country cuisines for other reasons, too. There were fewer varieties of fruit, vegetables and cheeses available than in Italy, and much more meat which was cheap and plentiful in America. Levenstein and Joseph Conlin report that the immigrants from Campania became established as grocers, such that the tomato paste, oregano and garlic basic to their region’s cuisine were more readily available than seasonings typical of other regions, such as Sicilian pine nuts, wild fennel, and saffron or ginger for the cuisine of Basilicata, the region to the east of Campania. But remembering that meat in Italy is costly, these dishes used meatballs the size of walnuts—unlike the American version that used meatballs the size of eggs—and also included other ingredients as ham and boiled eggs. The large portions served, and heavy seasonings of garlic, oregano and hot pepper flakes, are American developments. 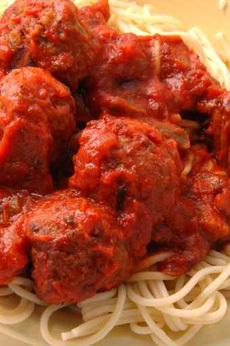 The American version of spaghetti and meatballs, large meatballs showing off the plentitude of meat in America, is unknown in Italy. Photo © Robyn Mac | Fotolia.